Sherman P. Bastarache is a Canadian author, currently living in the Moncton area of New Brunswick. He has two wonderful daughters and a perfect granddaughter, who he loves to spend time with. He enjoys reading and keeping up with the sciences, cooking, gardening and the great out doors. Nature, the teacher of all things. He is of the thinking: if you want to learn how to learn, watch your children learn! Among other important findings, he has discovered that grammar is nothing more than language relativity, derived from brain relativity: space/time oriented. After years of meditation and constant observation on the use of language and grammar, and postulating a complete theory on language origins, he finally wrote his first book on the topic. Sherman P. Bastarache has an inordinate interest in language. His interest began when he was in the eighth grade. His teacher was discussing evolution and a student commented that words cannot evolve. Suddenly, it occurred to Bastarache that if you add a 't' to 'here' you have 'there', which to some degree is language evolution. 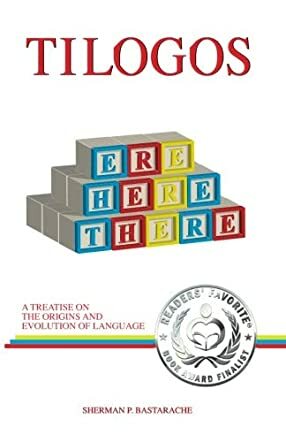 In his book "Tilogos: A Treatise on the Origins and Evolution of Language", Bastarache asks the question “is language innate?” Bastarache takes readers on a journey back to the sloppy, steamy beginnings when single-celled organisms inhabited the earth, or at least that is what evolutionists would say. Bastarache began his research as a Christian attempting to disprove language evolution. He nicknamed evolution evilution. As he continued his research he stumbled on to a method where clicks and squeals could have evolved into language. I suppose my mind is simple; I have always accepted creationism. Whatever be the manner he used, God created all. To me this means he also created language. I think Evolution and Creationism can and should go hand in hand. Sherman P. Bastarache is obviously very intelligent. His book is well-researched, thought-out and organized. He begins with the way animals communicate and moves his way through the written word. He discusses hieroglyphics, Roman letters, and Chinese symbols. Then he discusses how the brain processes language. "Tilogos" is a uniquely written book. I have never seen a book covering this topic. I found the topic interesting and comprehensive. Mr. Bastarache, you stimulated my brain and made me think of a totally different concept. Kudos. Although the reviewer is creationist, the way she summed up that both evolution and creation go hand in hand, also sums up my thought. I think the comment adds to the review and does not take anything away from it. The review as a whole sums up the book nicely! Thank you! On a side note, I was only hoping for a three and a half star or four and was plesently surprised to receive five.